Pet sitters or boarding are options to consider when you are absent. A few adventuresome cats enjoy traveling with their owners. But don't take your cat if she gets stressed in her carrier (a necessary confinement) or is likely to become stressed by conditions at your destination. For example, a cat that can't tolerate the liveliness of children will be stressed in a house full of youngsters. Also be sure to inquire about any pets your host and hostess may have. You don't want to spend your visit either separating feuding felines of keeping your cat locked alone in an unfamiliar room which certainly isn't providing a holiday for your cat. If your holiday travels will take you away for more than a couple of days, you will need to find reliable pet sitters. A friend, neighbor, or family member may agree to look after your cat. But don't be lulled into a pet-sitting arrangement just because it's convenient or inexpensive. Make sure that looking after your cat and providing a pleasant atmosphere for your cat is not an unreasonable burden on a friend or relative, especially when a well-intentioned volunteer may be preoccupied with holiday activities and forget to check your cat every day. A reputable service is SitterCity (www.sittercity.com) who does background checks on all their service members. They cover the whole spectrum of pets as well as children and seniors. Just click on their ad which is linked to their site. Another option is to hire a professional sitter. Many sitters offer helpful services in addition to looking after your cat. Most sitters will water plants, check for heat or power failures, bring in mail and newspapers, turn lights on and off, and open and close blinds if you request. You can also locate sitters online through sites such as Sitters Directories (www.pet-sitters.biz) and through the many home pages of individual sitters on the Internet. Referral by a trusted friend or membership in a professional organization, however, is no guarantee that a particular sitter is right for you and will provide the holiday care that you seek. Interview a potential sitter carefully before entrusting him or her with the responsibility for your holiday cat care and cat safety plus the keys to your home. Ask for and check references. 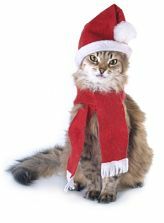 Determine if the person can realistically meet your desired holiday cat safety needs and your cat care feeding schedule. Ask if the person is willing or qualified to administer any necessary medications if your cat has a medical condition that requires close monitoring and medicating...such as diabetes...you need to be more selective in choosing your caregiver. One option is to look for a live-in pet sitter knowledgeable about your cat's condition. Ask your vet for a referral: veterinary technicians often work as cat-sitters and medicaters. Detailed written instructions are important to give to your pet-sitter. Specify feeding frequency, amounts, and brand names. Instruct the sitter to check that all cats are eating. Note the location of litter boxes and the disposal or storage location for used litter. Leave a telephone number where you can be reached, numbers for your veterinarian and a 24 hour emergency veterinary clinic, and the number of a trusted friend or neighbor who could "pinch hit" in an emergency. If your cats are the playful type, ask your sitter to play with them and rotate playthings from day to day to minimize "toy fatigue". Leave a more-than-ample supply of your cat's normal food and litter and tell your sitter where to find them. In my case, with 5 cats, I stack 5 rows of cans on the kitchen counter with the cat's name of each stack...so my caregiver can visually see who gets what. Some cats are not good candidates for "home alone" holiday absences cat care. 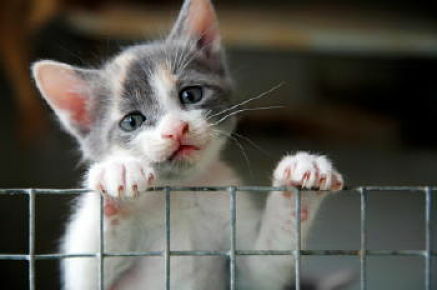 Boarding at a professionally managed cattery or with a veterinarian may be the best option if your cat is a kitten under six months, under treatment for a medical condition such as diabetes or cancer and requires frequent medication or close monitoring, or is known to go on a hunger strike when left alone.